On Monday, Governor Cuomo will ask state legislators to decriminalize the possession of small amounts of marijuana, but not because he’s wooing weed-loving New Yorkers. While Cuomo has yet to “evolve” on the issue of medical marijuana, he has come around on cops searching disproportionate numbers of black and Latino men, then arresting them if they have a joint in their pocket. The city’s stop-and-frisk program is coming under increasing attack, and Cuomo has decided to get into the fight. 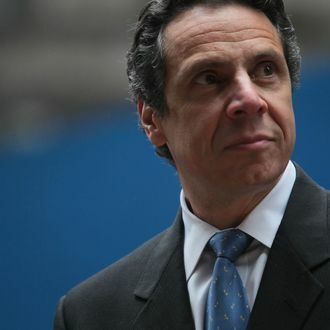 Though the governor’s proposal wouldn’t end the policy itself, it would prevent thousands of young male minorities from being put into the criminal justice system after officers essentially direct them to violate New York’s drug laws. In New York, pot possession is only a criminal offense if it’s burning or in plain view, up to 25 grams. Yet, during Mayor Bloomberg’s administration there have been 400,000 low-level marijuana arrests, making it the city’s most prevalent crime. You haven’t missed the roving bands of urban youths openly doing bong hits in the middle of the street. If an officer tells a man to turn out his pockets during a stop-and-frisk and a joint falls to the ground, that counts as “plain view.” Police Commissioner Ray Kelly told cops to knock it off in September. Stop-and-frisk was briefly overshadowed by Mayor Bloomberg’s new regulations on beverage sizes last week, but Cuomo targeting the city’s program puts the issue front and center once again. Though New Yorkers still haven’t exhausted their supply of food-related humor, it’s a reminder that being deprived of comically large sodas is the least of our problems.